Travel can often times be stressful, especially with airline delays, security screenings and crazy schedules. Luxury hotels are always looking for ways to ensure that their guests are relaxed and comfortable during their stay and one way to create that relaxation is for these hotels and resorts to offer spa packages. This pampering has become quite commonplace and even non-hotel guests have booked treatments at the spas that are housed inside some of the Best Hotels in the World. These tranquil suites tend to be beautifully decorated as well as quite comfortable, but some offer yet another highlight to their impressive surroundings, an astonishing view. Take a peek at a few resort spas that will literally leave you breathless. Terranea Resort is located in the LA area overlooking Catalina Island. The feel of the area is more Mediterranean coastal town than Southern California suburb. This gorgeous resort is only 30 minutes from the big city but the 102 acre estate creates a far away feel. Bungalows and villas can be found here with hardwood floors and vaulted ceilings but The Spa at Terranea might be the superstar of the operation. Overlooking the ocean, the spa has taken up 50,000 sq ft of oceanfront real estate to help connect guests with nature. 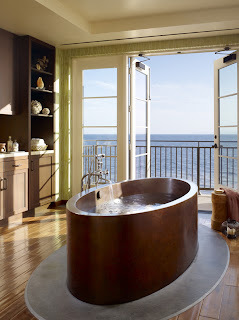 Soak away your worries in a copper tub while the ocean breezes whip through the suite. Although your eyes may feel heavy, closing them off from the incredible views will prove difficult. Every glimpse from the spa is amazing and the restorative treatments for health, beauty and spirit only add to the enchantment of this coastline hugging facility. Terranea Resort has a spa that will keep you coming back for more. Soothing your spirit in Miami might prove difficult for some, due to the consistent electric vibe that flows through the city all hours of the day. But one boutique hotel has done its very best to do just that. The Canyon Ranch, Miami Beach is a one of a kind hotel for the city by offering guests the ability to stay in style and luxury while benefiting from a health and wellness facility. Canyon Ranch is a hotel collection that strives to teach people a healthy way of life through fitness, nutrition, stress management and integrative wellness. Their Miami Beach location gives guests the ability to live well in all aspects. The Canyon Ranch Spa is the largest in Florida at 70,000 sq ft and as a guest you receive complimentary access to much of the facility. Because it is difficult to stay inside for a treatment in such a beautiful location, some therapies and massages are offered outside, ensuring a remarkable experience. 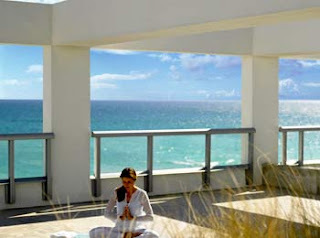 Practice yoga by the sea at the amazing Canyon Ranch, Miami Beach. There is no doubt that the views on any of the Hawaiian Islands are marvelous. The Hyatt Regency Maui has taken the beauty of the islands and used it to its advantage. By creating a spa where the windows bring the tropical paradise that is outside, indoors, guests get to experience a garden like setting during any of the services. Spa Moana utilizes the healing powers of Hawaiian botanicals to energize and purify guests. Select any treatment and feel pampered with an unforgettable view and products with exotic ingredients. The Hyatt Regency Maui knows that a trip to Hawaii will be awe-inspiring, so a visit to the spa needs to be as incredible as the island itself. Vacation allows us to indulge in the not so everyday experiences, to head out and enjoy the wonder that is found in new places, letting us slip away from the monotony and the stresses of everyday life. During your stay at many exclusive hotels and resorts, the spas are ready to satisfy your desire for relaxation and rejuvenation. Check out these spas that want to provide you with an amazing treatment as well as a view that will leave you ecstatic.